So February’s challenge was met and surpassed by several bonus minis painted. Hoody Hoo! I managed to keep on track for this, even when being so flighty as I am. Seems to be a recipe to get something done. For March I think I want to do something about squads, teams or units. As in squads I have started (i.e. done a test piece) but not completed. I seem to have rather a lot of them cluttering up the shelving. So I think a manageable challenge will be to paint 4 squads during the month, with a minimum of 10 models in each (counting the test piece), or equivalent numbers of new painted minis to fill up squads, teams or units I already have some models for. So, at least 36 miniatures, then. That needs an average of 9 minis a week, or one every work day, two each Saturday and Sunday. Of course, I will not be painting these singularly, but in batches. Better to think of it as a unit a week. There will be at least one weekend this month I will be otherwise occupied, so good thing I got the first squad done during the first day of March! 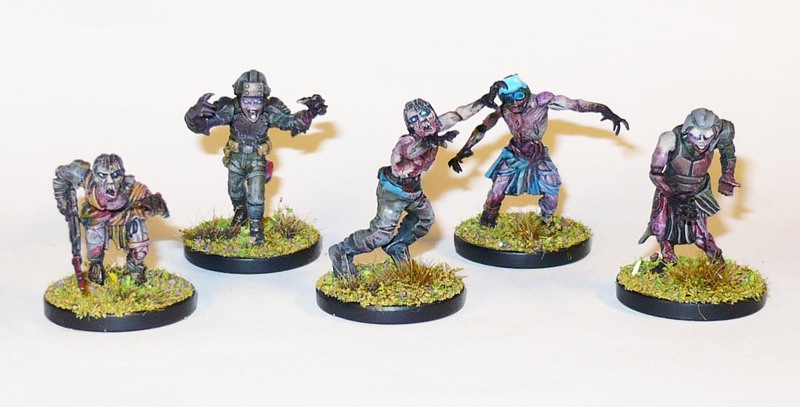 Ten more of the big unit of converted Mantic sci fi zombies I started in January. As I have something like 50 of them ready for painting, I expect more of these will be used to fill out the numbers if needed. I get clearer pictures with not so many in the frame at a time. These are made up several types of Mantic miniatures: Kings of War Fantasy Zombies, Deadzone Plague Zombies, Kings of War Fantasy Ghouls, and Warpath Corporation Troopers. All hacked up and glued together. If you think some of the bitz’ are somewhat off scale, it is because the Deadzone Plague Zombie parts are more “heroically” proportioned ( = thicker/ larger) than the older fantasy and warpath minis. 25mm bases, plastic / restic conversions. 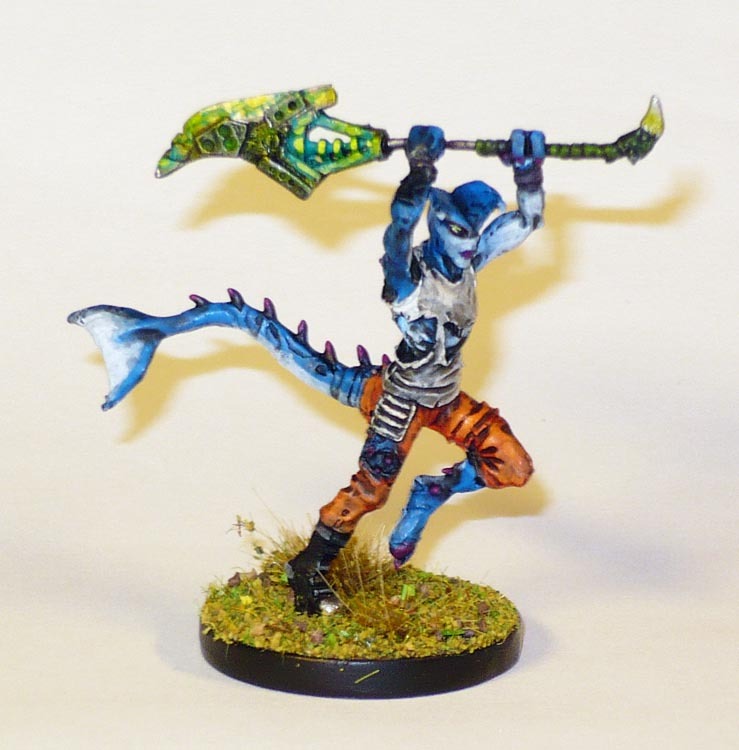 And we also have our first Bonus mini! ‘Cause I love fish sticks! This piece has a ridiculously small diameter shaft-part connecting the axe-head to the hands. It bends all the time, and will most probably snap at some point and be really difficult to repair. Apart from that niggle, I think it is a great mini. PreviousFebruary Painting Resolution, chapter 14. That’s all folks!